There’s more to Contacts than what meets the eye. In this section, we’ll look into all the important things that we’ve not explained before. The invoices, estimates, notifications mails etc. that you send out to your customers can be unique to each client. In Zoho Invoice, you can personalize your templates such that their design is different and very client-specific. These specifications are not only useful to meet business expectations, but also to bring about the perception of a personal touch among your clients. You can associate pre-defined default or customized pdf and email templates to your contacts as desired. This includes the ones you have created and added to the Zoho Invoice template gallery. Select the contact to which you want to associate a template. Click the More dropdown in the top-right corner of the Contact Details page. 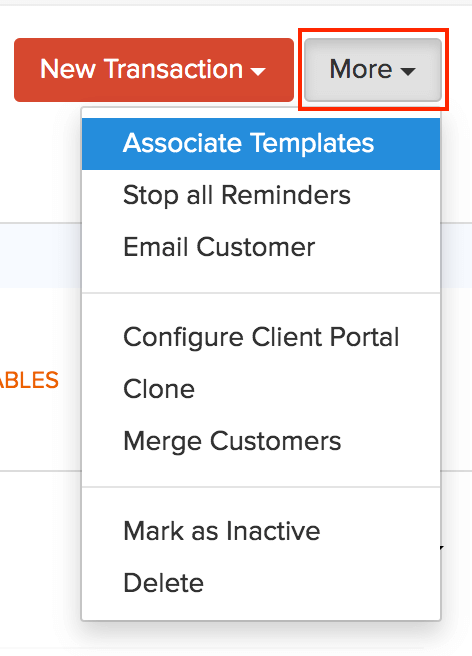 Select Associate Templates from the dropdown. 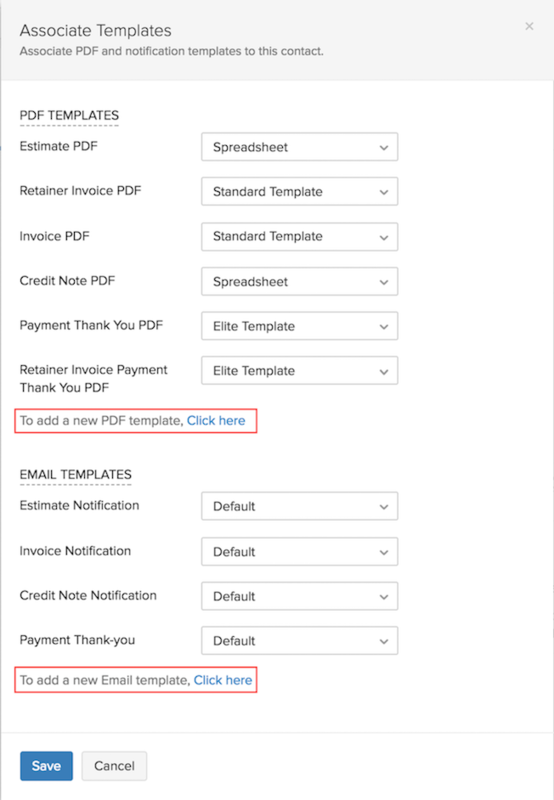 In the Associate Templates pop-up page, you can create, select and assign a customized PDF or Email Notification templates for your contact as you desire. Once you’ve associated these templates to the respective module PDFs, they will be the default templates for all future transactions carried out with the selected contact. Click the Click Here link at the end of the section to go to the Template Creation page. Select a template from the existing templates apart from standard templates that are available. Hover your mouse over the template you want to use and click the Use This button. Also, you can click the Preview button to see a perview of the template. After selecting the template, you can customize the template as per your preference. Hover your mouse cursor over the template and click the Edit button. The template customization can be done in the following sections: Template Properties, Header, Item Table, Total and Footer. Each section has elements or properties that can be edited and customized by selecting from the options provided on the customization pane. Learn more about Template Customization. After customizing, click the Preview button to preview your customization. Click the Save button once you finalize the changes. Once you associate a template to each notification, they will be set as the default templates for all future mail notifications sent to that contact. Click the Click Here link at the end of the section to go to the Email Template creation page and create a new email template. Learn more. After creating a new email template, click Save to confirm associating templates and proceed. Zoho Invoice allows you to send automated payment due reminders to your customers. 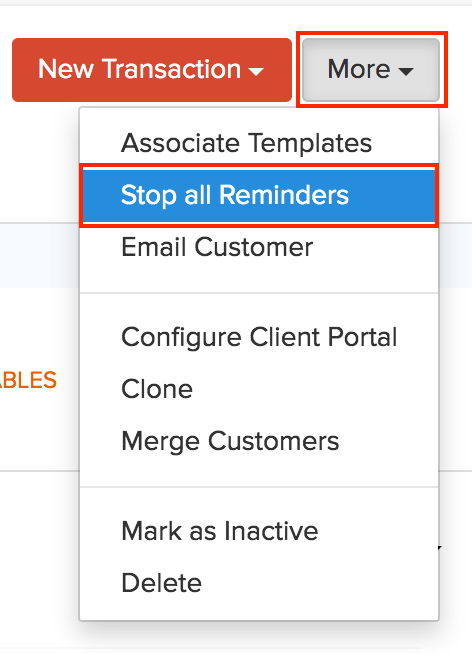 These reminders can be configured in the Settings module for selective durations as you desire. Now, if you do not want to send these reminders to specific contacts you can stop them. Select the contact for which you wish to stop the payment reminders. Click the More dropdown on the top-right corner of the contact details page and select Stop All Reminders. Payment reminders will be stopped for this contact immediately. Later, if you want to re-enable the reminders for this contact, you can do so. 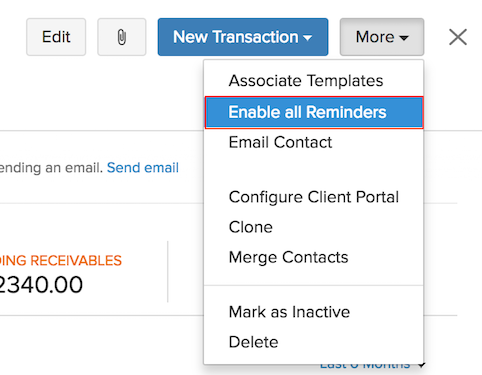 Select the contact for which you want to enable the payment reminders, click the More dropdown, and select Enable All Reminders. While doing business with your customers, you might want to communicate something important related to your business to your customers. 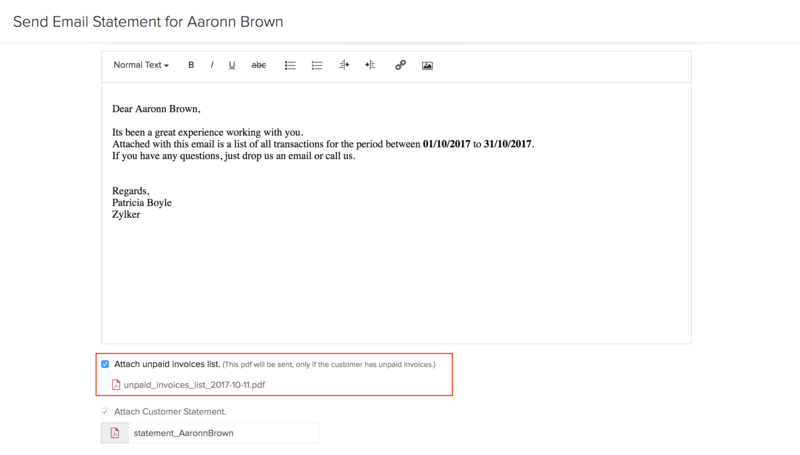 You can send such emails directly from Zoho Invoice, easily. 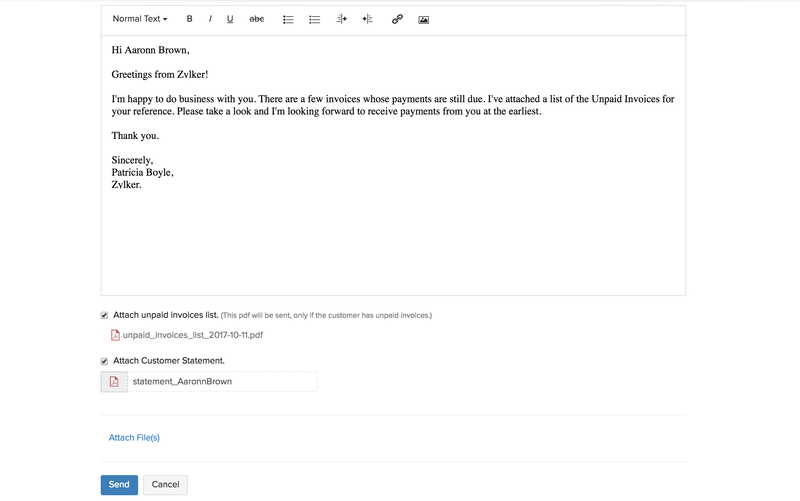 Additionally, you’ll be able to attach a list of unpaid invoices list to the email and send it to your customers. Select the contact to whom you want to send an email. Click the More dropdown on the top-right corner of the window and select Email Contact. 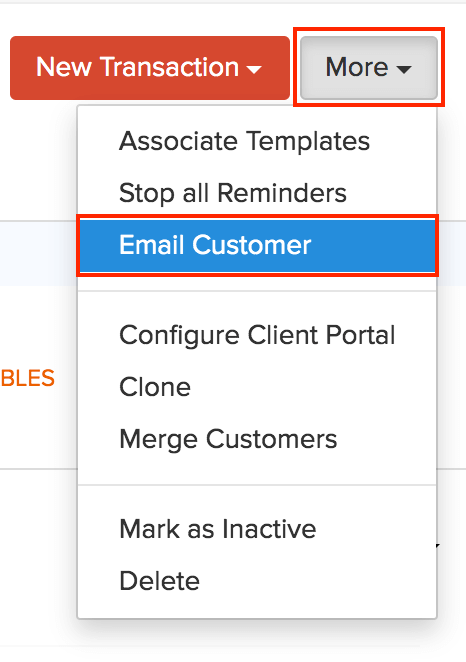 In the email draft page, click the Send To dropdown and select the customer’s email address. Click the Cc dropdown and select another email address pertaining to the customer to carbon copy the email. Insight: Only the email addresses that you’ve added to the contact will be shown in the dropdown of Send To and Cc. If you want to instantly add an email address, click + Add Contact Person in the Send To dropdown; enter the contact person’s details and click Save and Select. Enter the content you want to send to your customer. Check Attach unpaid invoices list to attach and send a PDF of all the unpaid invoices list along with the email. The PDF will be attached only if there are unpaid invoices for that contact. Check Attach Customer Statement to attach and send the customer statement of the present month to your customer. Learn more about sending customer statements. Click the Attach File(s) link to attach any other document you might want to send to your customer. At times, you may find yourself in a fix when your customers pay for invoices in different currencies. In that case, you can duplicate the contact twice and set different currencies, one for each. You can do this by cloning the contact. Navigate to the Contacts module in the left sidebar. 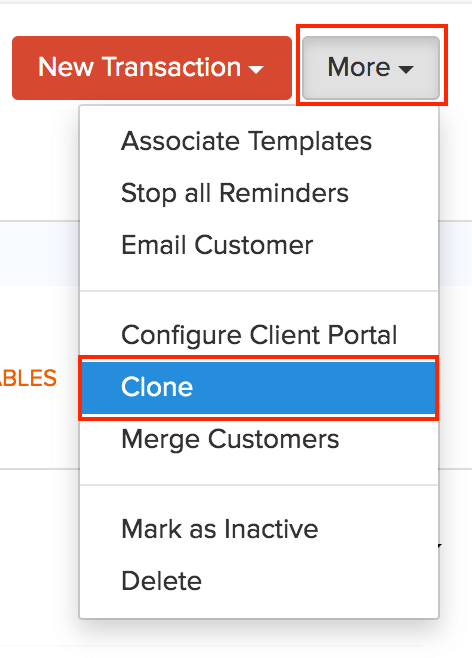 Click the contact you want to clone. Click the More dropdown in the top right corner and select Clone from the drop-down. A Clone Contact screen will open where all the details of the contact will be auto-populated. Make sure all the details are correct and click Save. Pro Tip: If you have not activated the client portal for the original contact, then you can activate it for the cloned contact. When you import contacts from other systems, it is possible to have multiple contacts for the same customer in the Contacts module. You can merge them together to make them a single contact and bring all the transactions under a master contact. Warning: Once you merge contacts together, they cannot be separated back as individual contacts. All transactions associated with them will be listed under the master contact and the other contacts will be marked as inactive. You can mark the inactive contacts as active again, but the transactions under them will be erased. 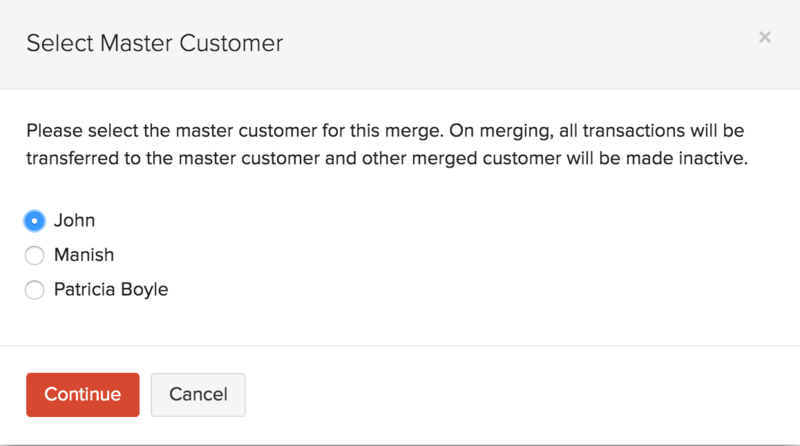 Prerequisites: The contacts you are merging must have the same currency to merge them together. It’s best to follow this method, when you want to merge more than two contacts together. Go to the Contacts module in the left side bar. Click the check-box of the contacts you want to merge together. 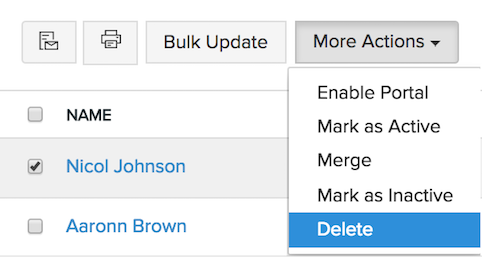 Click the More Actions dropdown and select Merge. Select the master contact from the contacts displayed and click Continue. Click Confirm in the next pop-up page. When you want to merge only two contacts, follow this method. Select the contact you want to merge with the master contact. Click the More dropdown and select Merge Contacts. Select the master contact from the dropdown and click Continue. Go to the Contacts module. 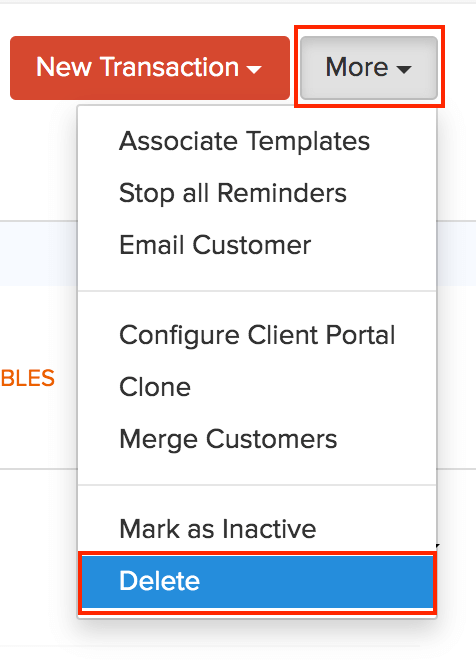 Select the contact to be marked as inactive by clicking the check-box. You can select multiple contacts as well to mark them as inactive. 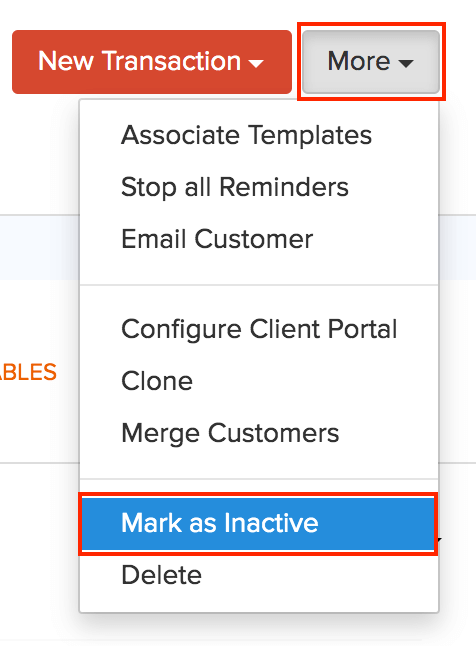 Click the More Actions dropdown and select Mark as Inactive. You might want to delete a contact when it has become obsolete. However, you cannot delete a contact if transactions are recorded under it. You must delete all the transactions before you can delete the contact. If you want to retain the transations, you can mark the contact as inactive. Select the contact to be deleted by clicking the check-box. You can select multiple contacts as well to delete them. Click the More Actions dropdown and select Delete. Click the Delete button in the pop-up to confirm and delete. Alternatively, you can also delete individual contacts by selecting them. Select the contact you want to delete . Click the More dropdown on top of the details page. When you have a large customer base, it is diffcult for a single person to handle all of them. Also, it is possible to miss out on some customers when you’re pre-occupied with your business. To help you in scenarios like these, Zoho Invoice offers you the ability to assign one of your employees as a contact owner to a contact or a group of contacts. Now, the contact owner can create, view or edit transactions for the contacts assigned to them. You must have at least one of your employees as an user in Zoho Invoice with the Staff - Assigned Customers Only role. This role is available by default under the Roles tab in Settings. Learn more about Users and Roles. You must be an admin or an user with access to assign other users as contact owners. 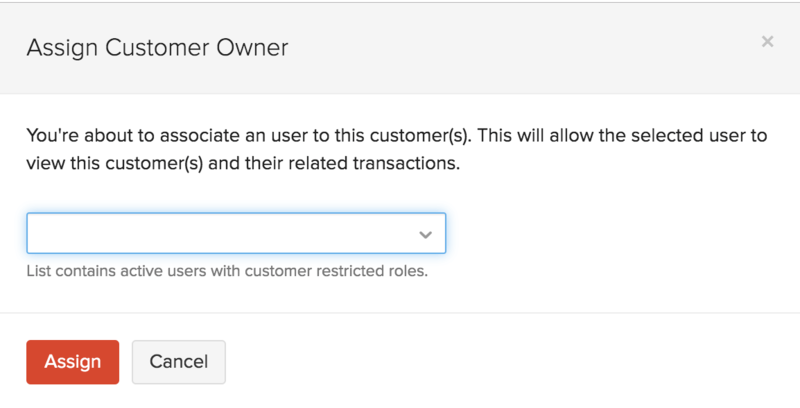 After adding an user with the Staff - Assigned Customers Only role, you can assign them as contact owners, either while adding a customer as a new contact or after adding a customer as a contact. Select one of the users listed in the dropdown against the Contact Owner field. Select the contact to whom you want to assign a contact owner. Click the More dropdown and on the top-right corner and select Assign Contact Owner from the dropdown. Select an user from the dropdown and click Assign. Check and select multiple contacts. Click the Assign Contact Owner button in the top bar. Select a user from the dropdown and click Assign. At times, customers might delay in making the payments for the invoices that you’ve issued to them. It could be due to a variety of reasons. However, you can send them a copy of all their unpaid invoices and urge them to make the payments that are due. Attach them while sending an email. Select the contact to whom you want to send the customer statement. Click the Statement tab in the Contact Details page. Click the Mail icon on the top-right corner of the page. Check Attach unpaid invoices list to attach a PDF of the unpaid invoices list of the particular contact. The export option in the Contacts module allows you to export the contacts and the contact persons in CSV or XLS format. As soon as you export, the data will be downloaded to your system in the format that you’ve chosen. Click the Hamburger icon in the top-right corner of the window. Select Export Contacts or Export Contact Persons option from the dropdown. Select the export file format as either CSV or XLS. 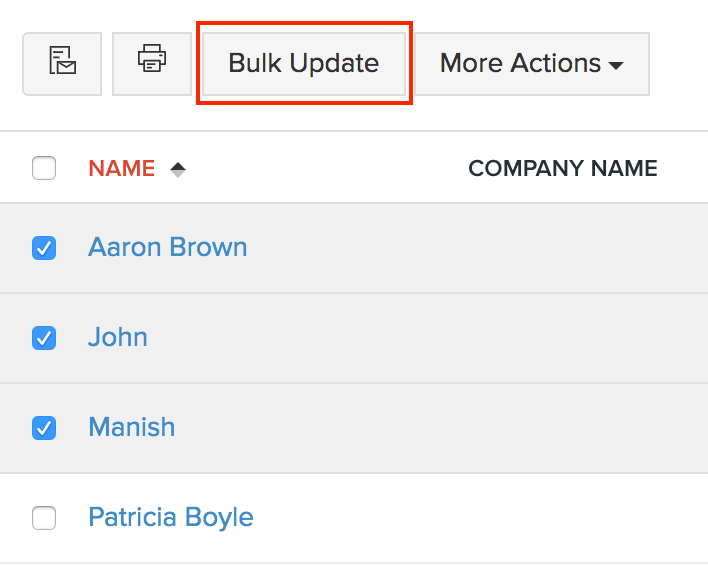 Bulk Actions allows you to perform a particular action on a group of contacts. You will be able to send or print customer statements of a group of customers in a single attempt, update contacts, enable Client Portal, mark contacts as active or inactive and delete contacts. 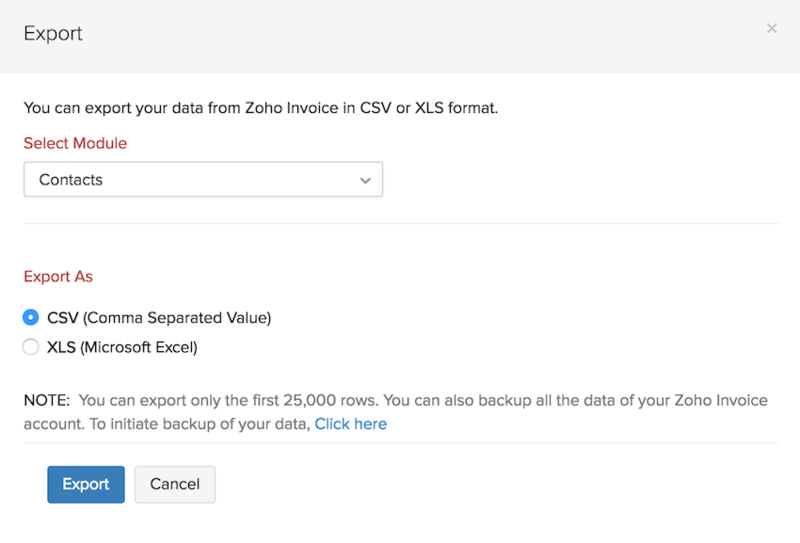 Let’s look into how you can perform bulk actions in Zoho Invoice. When you select contacts in bulk and send bulk statements, each customer’s statement is sent to their email address respectively. The statements that are sent to every customer will be of the same period. 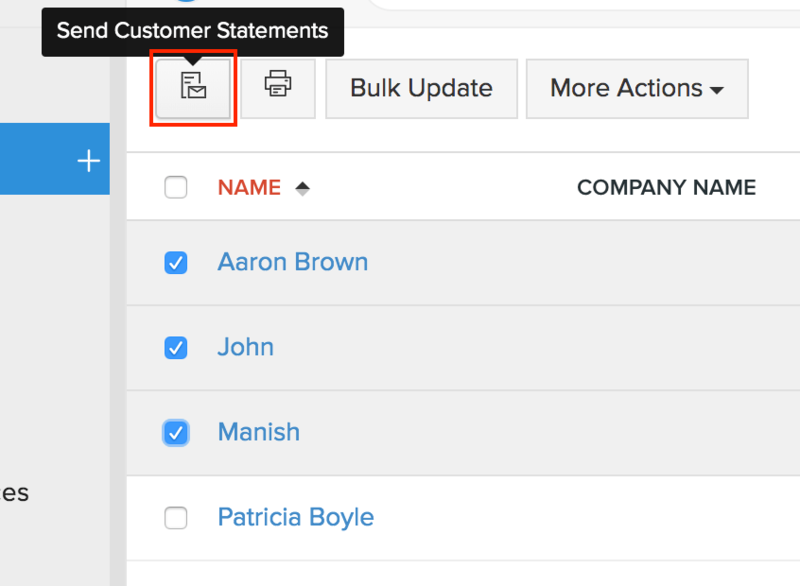 Select the contacts to which you want to send bulk statements by clicking the check-box. 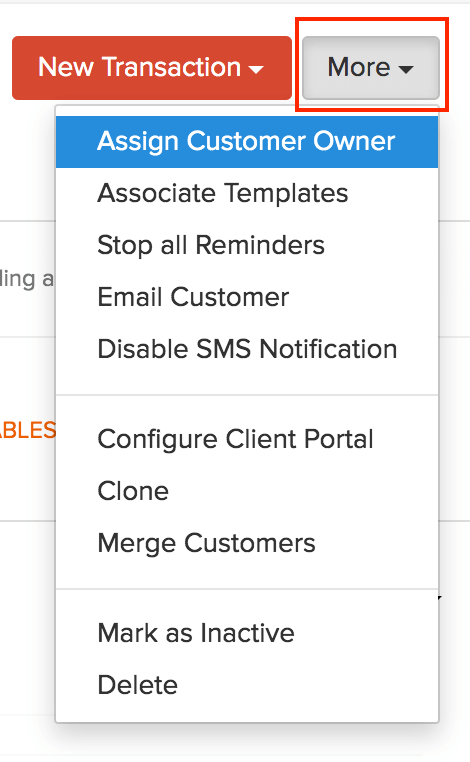 Click the Send Customer Statements icon in the top bar. Select the period for which you wish to send customer statements. Click Send Statements. The emails are scheduled and sent. You will be notified as soon as the statements are sent to your customers. Insight: You can send a maximum of 25 customer statements at a time. So, it’s best to select a maximum of 25 customers whenever you want to send customer statements in bulk. 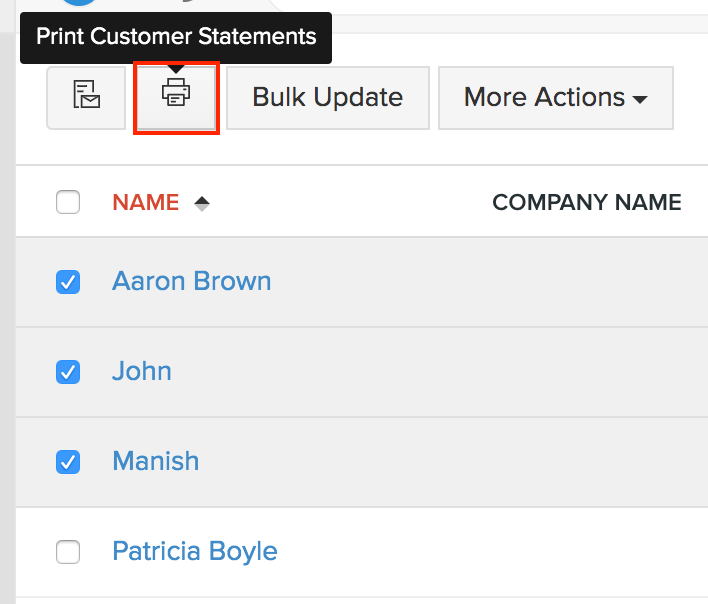 Select the contacts whose customer statements you want to bulk-print, by clicking the check-box. Click the Print Customer Statements icon in the top bar. Select the period for which you wish to print customer statements. Insight: You can print a maximum of 25 customer statements at a time. So, it’s best to select a maximum of 25 customers whenever you want to print customer statements in bulk. 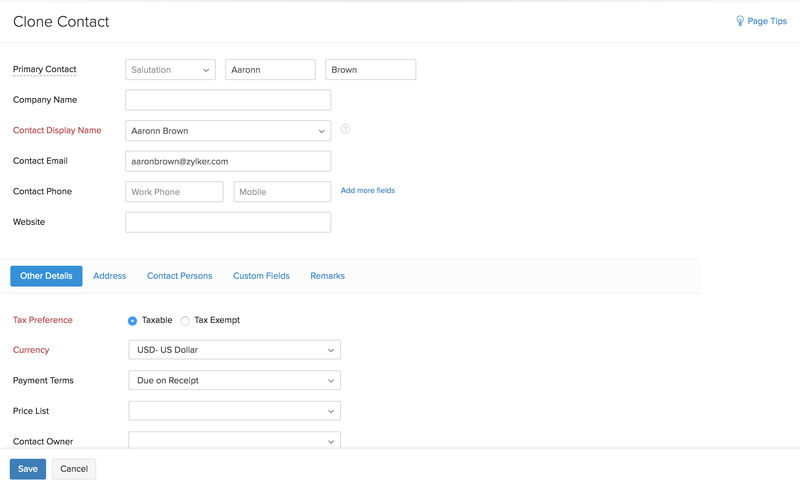 Bulk Update allows you to update fields such as Currency, Payment Terms, Price Lists and Custom Fields in the contacts in a single attempt. Select the contacts whose information you want to bulk-update, by clicking the check-box. Select the appropriate Currency and update the new Payment Terms. Click the Update Fields button. 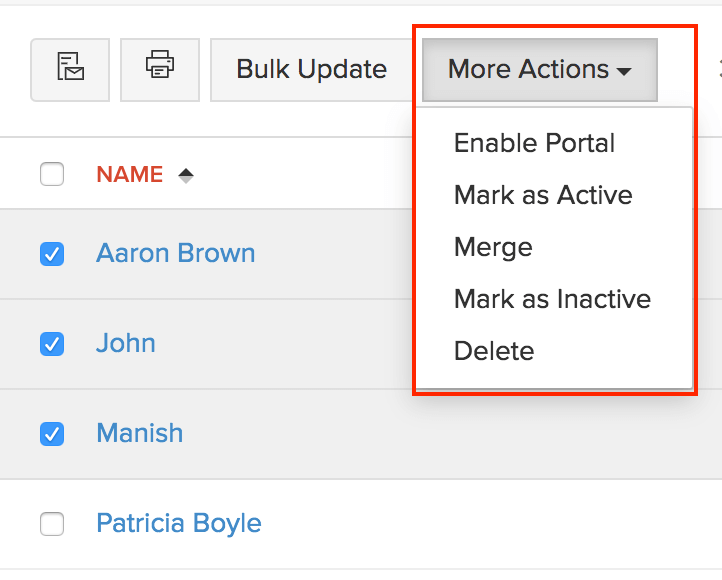 You can enable Client Portal in bulk for your contacts, mark contacts active or inactive and delete them. Select Enable Portal to enable Client Portal for all the contacts. Click Mark as Active or Mark as Inactive to mark all the contacts as active or inactive respectively. Select Delete to delete contacts in bulk.